Release Date: July 21st, 2006 (AMC/Loews Village 7 and AMC Magic Johnson Harlem 9) by Teton Films. The Cast: Helen Mirren, Cuba Gooding, Jr.,Vanessa Ferlito, Macy Gray, Joseph Gordon-Levitt, Monique, Stephen Dorff. 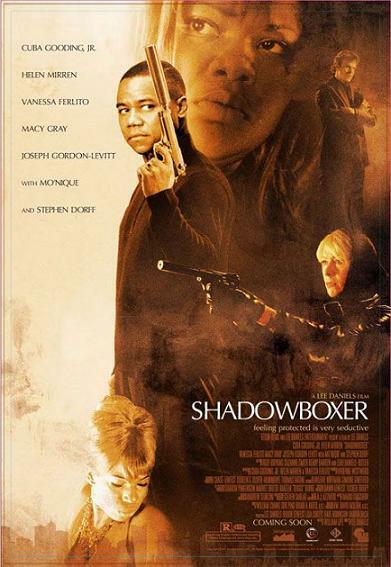 ENTERTAINMENT VALUE: Shadowboxer has a great cast and stylish visuals, but suffers from a multiple genre disorder. At once, it’s a martial arts film, san action film, a drama, romance and a tragedy. Helen Mirren gives a decent performance as Rose, a woman who gets diagnosed with cancer early in the first act and doesn’t feel comfortable with continuing her profession as an assassin. When on her last assignment to kill a vicious man named Clayton (Dorff), she stops short of killing his wife, Vickie (Ferlito) because she’s pregnant—and, coincidentally, gives birth exactly at the time they run into each other. Soon enough, Rose and Mikey bring Vickie along with them incognito. The plot gets more complex when Rose’s young doctor (Gordon-Levitt) gets involved in the tangled web. Unfortunately, screenwriter William Lipz includes so many subplots with so many plot-holes. For example, the police don’t even notice when bodies start piling up. There’s a contrived subplot about a romance between Rose and Mikey as well as corny flashbacks to Mikey’s traumatic childhood. Lipz does have a few interesting twists and surprises, but it’s difficult to care about any of the unrealistic characters. Director Lee Daniels does his best with the stylish cinematography and some nice use of symbolism, but often the transition between scenes feel awkward and too abrupt. A more tighter and focused screenplay would have helped to make this much more engaging to watch without feeling contrived or convoluted. INSULT TO YOUR INTELLIGENCE: Contrived, convoluted and unfocused. IN A NUTSHELL: A great cast and stylish cinematography doesn’t make up for an unfocused, contrived, and convoluted plot.